Kathryn Taubert's story offers hope and guidance for anyone starting over after the death of a spouse. From the depths of despair, this twice-widowed, retired 57-year-old widow with Tourette syndrome and a self-described "couch potato," built a new life as an athlete, jazz recording artist, international volunteer, and successful author. Better To Have Loved is a love story, an illustration of what caregivers of the desperately ill endure, and a testimonial to the power of determination in surviving bereavement. Checklists on how to survive bereavement make this book a resource for those experiencing bereavement or caring for someone who is. For anyone who ever asked themselves how to go on, this book is for you. YEVU is the true story of Kathryn's solitary journey to Africa on a volunteer, humanitarian mission. Having spent the years immediately prior to her journey rebuilding her life after a series of personal losses, Taubert’s journey of healing led her to seek an opportunity to do something she’d never done before, on a continent she’d never visited, with a people and culture she’d never previously known. Living with members of the Ewe Tribe in the village of Abutia-Kloe in the Volta Region of Ghana, Taubert found the deep bonds and lasting friendships that can be forged between peoples of widely disparate backgrounds and cultures. It’s as much a story of an incredible native people who opened their hearts to a senior citizen from the USA, as it is a testament to the fact that it’s never too late to give of oneself to others, and in the process, get far more in return. For anyone of any age who ever thought they might want to take a “volunteer vacation” to a developing country, Yevu is a must-read book. Yevu (White Woman): My Five Weeks With the Ewe Tribe of Ghana, West Africa, will soon be released in E-book format also and available at a variety of online retailers, including Amazon and Barnes and Noble. Stay tuned! Click ITUNES icon to download the entire album or one tune at a time for MP3 players. Buy songs from both CDs on Itunes (click "View More By This Artist") to see both CDs. An eclectic collection of hauntingly beautiful love songs, swinging vocal standards in English, Portuguese and Spanish, with guest artists on piano, guitar, sax, trumpet and vocals. Timeless melodies and lyrics that say it all. 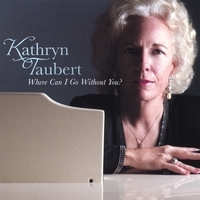 2008 CD "Somewhere In Time"
“Somewhere In Time” contains Kathryn’s unique vocals in several genres, including old standards, Latin Bossa Nova, and her stylized favorite of the classic “Clair de Lune.” Kathryn wrote the lyrics to “Some Other Sunset,” “Somewhere in Time,” and “Clair de Lune” for this album, which also includes vocals in English and Portuguese, as well as her popular version of “I Wish You Love” in French.